Chicago mayor Rahm Emanuel may face a formidable challenger when he runs for re-election in 2015: Cook County Board President Toni Preckwinkle. Though Preckwinkle says she will seek a second term on the county board in November, there is a precedent for a quick switch to the mayoral election in February: then-U.S. Rep. Harold Washington, Chicago’s first black mayor, did in in the historic 1983 election, against all political odds. Preckwinkle would be the city’s first black female mayor. She won the hearts of many of the city’s reformers by defeating incumbent county board president Todd Stroger, widely viewed as corrupt, in the Democratic primary in 2010. She raised suspicions anew when she backed Joe Berrios, a party machine man, for county assessor. But her performance in office has been widely hailed, especially her work reversing an unpopular sales tax hike. 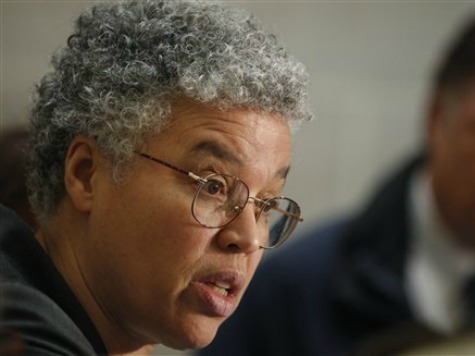 However, like other Chicago radicals, Preckwinkle has since soured on her protégé somewhat, and was already expressing misgivings about him in 2008, even though she was an Obama delegate to the Democratic National Convention. The radical Preckwinkle remains in the good graces of the far-left: Bill Ayers, for one, said of her in December: “I love Toni Preckwinkle.” He also suggested that she should run against Emanuel for mayor. And veteran Chicago political reporter Carol Marin suggests that Preckwinkle would have a good chance, given Emanuel’s struggles: “…[G]iven that Emanuel has alienated the black community with neighborhood school closings but more charter openings — and infuriated cops and firefighters waiting for contracts and bracing for cuts — Preckwinkle has a voter base that Emanuel lacks,” Marin wrote in the Chicago Sun-Times Sunday. It is not clear that Preckwinkle would prove any better at solving the city’s pension problems, its rampant crime, and its economic woes. Yet the city’s black community has long yearned for a revival of the Washington days, and though Emanuel won in 2011 with the support of the business community, it is possible they could make their peace with Preckwinkle, too. As for Obama, It is not clear whom he would support–or whether it matters.